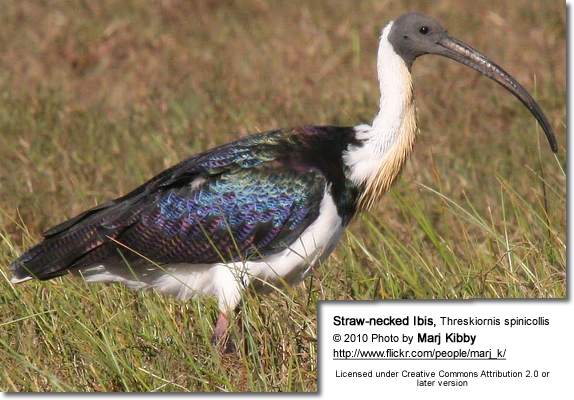 The Straw-necked Ibises (Threskiornis spinicollis) occur naturally in Australia, New Guinea, and parts of Indonesia. 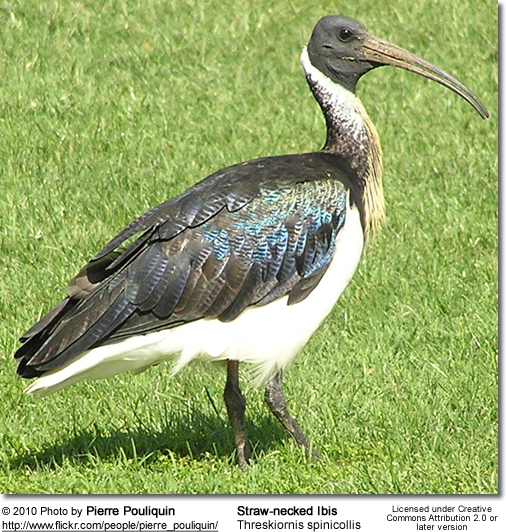 Straw-necked ibises are found throughout Australia, except parts of Western Australia, South Australia, and south-west Tasmania; as well as on Norfolk Island and Lord Howe Island, in Indonesia and New Guinea. In Australia, they are most common on the east coast. They inhabit shallow freshwater wetlands, cultivated pastures, edges of swamps and lagoons, and both wet or dry grasslands. They usually stay away from dry and saltwater areas, as well as coastal mudflats. This nomadic species is always on the move, in their search for suitable habitats. They are often seen perching high branches of bare trees. 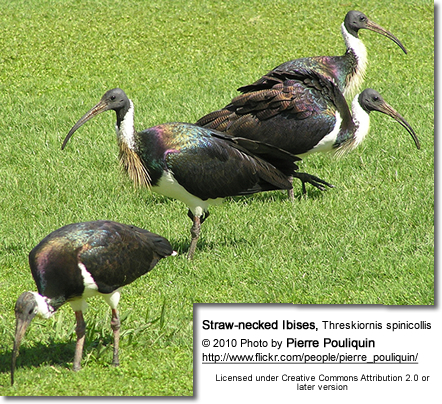 The large Straw-necked ibises measure 60 – 75 cm (24 – 30 in) in length. 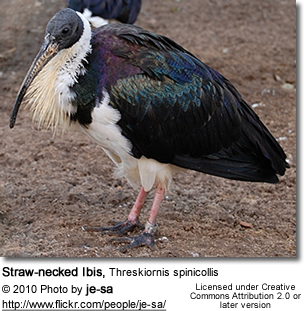 Adults can be identified by their distinctive straw-like feathers on their necks, for which this species was named. In sunlight, an iridescent sheen can be seen on the darker wings. The back and collar are blackish in color. The neck, plumage below and the under-tail feathers are mostly white. The bill is long, black and downcurved. The legs are usually red on top and dark grey towards the feed. Males and females mostly look alike, although males have longer bills and females have a dark band across their upper chest. Juveniles have a duller plumage and shorter,straighter bills. They also lack the straw-like plumes found on the neck of the adults. 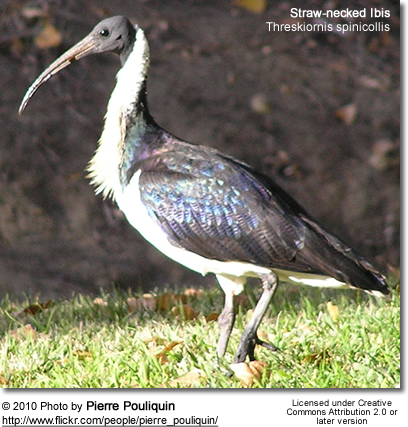 Straw-necked ibises mostly feed in shallow waters on aquatic insects, mollusks, frogs, and food sifted from the water surface. Most breeding activities are observed in March in the north and from July - December in the south. However, breeding can occur at other times - particularly after heavy rains. 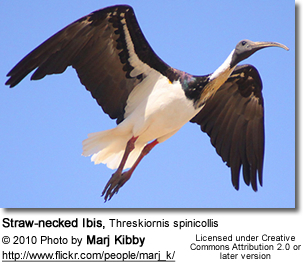 They typically nest in colonies, often with the Australian white ibis, and other water birds. The nests are shallow cup-shaped platforms of sticks, grasses or reeds that are typically situated on trees near a body of water, such as rivers, swamps or lakes. The average clutch consists of 2 – 4 eggs. The nests are often reused year-after-year.